Denmark isn't the only country with a New Year tiara tradition. 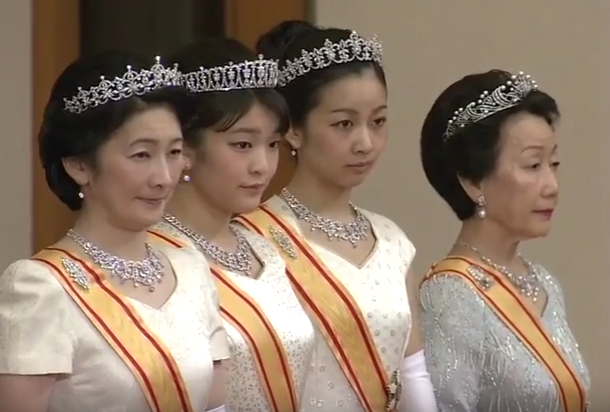 For the annual reception at the Imperial Palace in Japan, the ladies wore some of their finest gems. Empress Michiko no longer wears tiaras, for reasons relating to health and comfort, but she always gives us something bejeweled to gaze at for this event. This year she chose a major pearl necklace: five gorgeous strands of pearls linked by a diamond-studded clasp, which she wore elegantly positioned to one side. She also wore earrings to match. 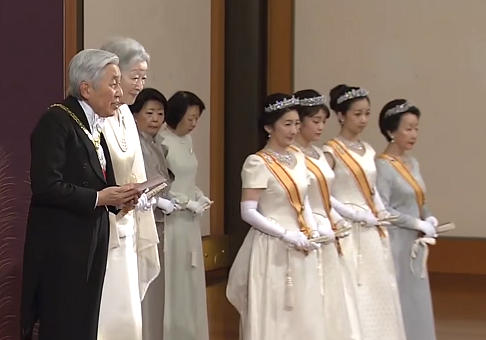 As usual, several of the princesses from the imperial family stood in full court dress off to the side of the dais. Here's a rundown from left to right. 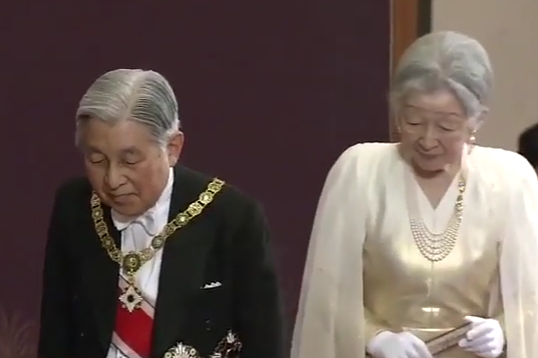 The Princess Akishino wears her wedding parure. Kiko's elder daughter, Princess Mako, wears her own diamond parure; next is the younger Akishino daughter, Princess Kako, wearing her diamond parure. Finally, the elegant lady in the lovely diamond and pearl parure is the Princess Hitachi, sister-in-law of the emperor. Intriguingly, this is a different diamond and pearl tiara than the one she wore last year, though the rest of the jewels appear to be the same. This image shows very clearly how regimented jewel-wearing is in the court of the Japanese imperial family, doesn't it? Also as usual, Crown Princess Masako was at the palace during the reception, although she doesn't take part in the public greetings. At the end of this video, you can see her arriving in the car with Crown Prince Naruhito and Princess Aiko; she's wearing the gorgeous Pearl Sunburst suite.